Australian radio station 2Day FM and two of its DJs Michael Christian and Mel Greig are facing intense criticism for their prank call to London's King Edward VII Hospital, the hospital where Kate Middleton was being treated for hyperemesis gravidarum until Thursday. On Friday, one of the nurses who took a phone call from the radio station, Jacintha Saldanha, was found dead. The Daily Mail is reporting she committed suicide. The story broke at 9:30 a.m. ET, at around 2:30 p.m. GMT, or around 1:30 a.m. in Sydney where 2Day FM is based. Later on Friday afternoon, Australian media reported that both hosts would not be returning to 2Day FM until further notice. Southern Cross Austereo (SCA) and 2Day FM are deeply saddened by the tragic news of the death of nurse Jacintha Saldanha from King Edward VII’s Hospital and we extend our deepest sympathies to her family and all that have been affected by this situation around the world. Christian and Greig called the hospital earlier in the week and impersonated the Queen. The hosts were able to get a nurse on the air who divulged a few details about Kate Middleton's condition. The report resulted in a chorus of criticism from around the world directed at the radio station. 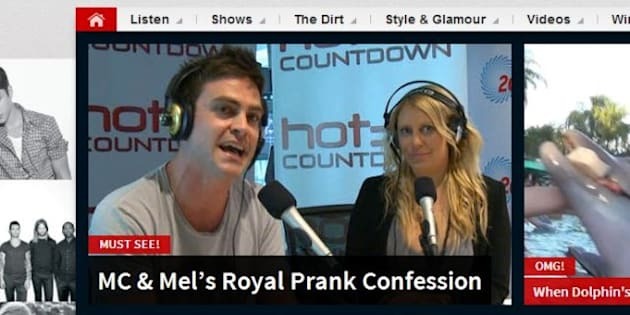 Dozens of comments have been left on the story featuring the prank call which 2Day FM has online. The prank is still featured prominently on the radio station's website and the station is reportedly still playing clips from the prank on air. The station has not posted a response on its Twitter account and DJs Michael Christian and Mel Greig have reportedly deleted their Twitter accounts. On Twitter, many are calling for the DJs to be fired. The station has also been getting hundreds of complaints on its Facebook page, and several posts have been deleted. "Shame, Shame, Shame on you for employing such stupid and thoughtless people as your DJs. This poor nurse had the world knowing that she had been fooled by these ignorant people. Words can't express the disgust I feel," wrote one woman on Facebook. Her post has since been deleted. This isn't the first time 2Day FM has faced controversy. The Daily Mail reported that the radio station once forced a 14-year-old girl to confess to being raped. Australian broadcast regulators have also issued warnings against the station about its content.